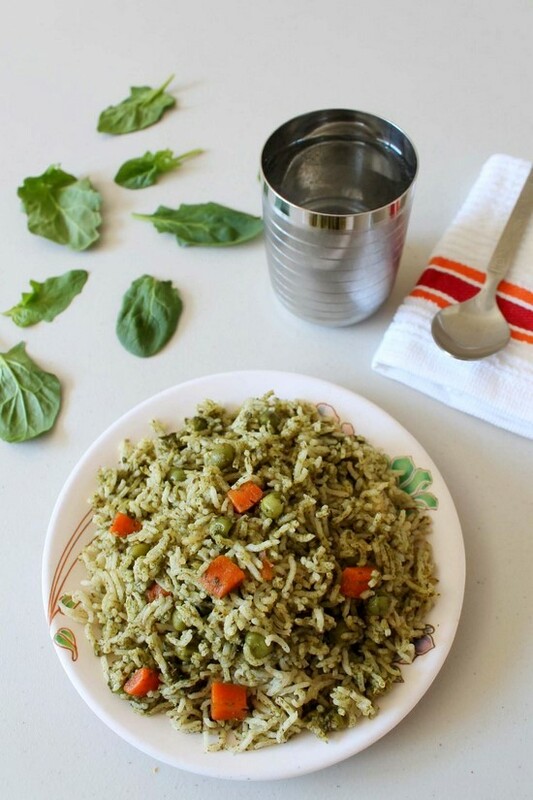 Palak rice recipe is HEALTHY and flavorful rice dish. Perfect dish to pack into lunch box for kids and adults. There are two different ways of making spinach rice. Cook the rice with spinach puree. I am sharing this method today. Another method is rice sauteed with chopped spinach and spices. I have not used any powder spices in this recipe. I dry roasted the whole spices and ground them with onion and spinach. And you know that fresh masala always gives nice flavor and aroma to the dish. 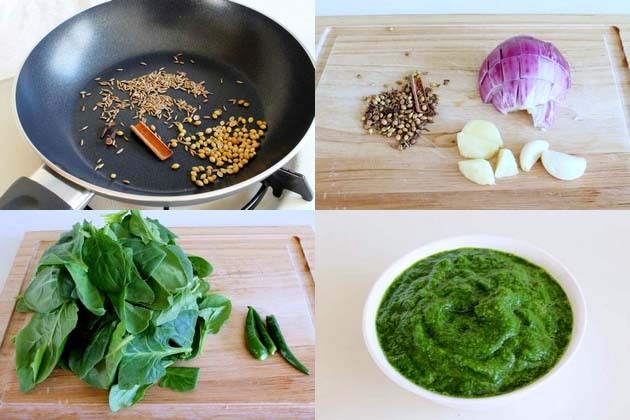 In this recipe paste is made from spices, onion and spinach. The rice cooked with this paste. So rice absorbs the flavor from this paste. Thus it is so delicious and the best. I do make this rice very often. Because hubby likes it in his lunch box with plain yogurt. 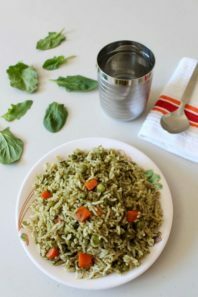 This Palak rice is very healthy rice recipe. As spinach is very nutritious green. This is the perfect way to add some greens in your diet. The best palak recipe for the fussy kids or for those who doesn’t like palak. Try it once, I am sure you will like it. 1) Wash the rice under running cold water till water runs clear. Soak into enough water for 20 minutes. 2) Then drain the water and keep it aside. 3) While rice soaking, do the prep work. Dry roast the spices (cinnamon stick, cloves, cumin seeds and coriander seeds) on low-medium heat. Do stir continuously. You will get nice aroma of spices. Remove it from the pan and keep aside. 4) Prep the ingredients to make paste. Chop onion, ginger and garlic. 5) Also wash and remove hard stems of spinach. Remove the stems of green chili as well. 6) Take everything (dry roasted spices and veggies) into the grinder or blender. Make smooth paste and keep it aside. If needed add 2 tablespoons of water. I have not added any water. The water from washed and damp spinach was enough to make paste. 7) Heat the oil in a saucepan on medium heat. Once hot add bay leaf. Saute for 30 seconds. 9) Cook for 4-5 minutes. Or till all the moisture is evaporated. It starts to leave the sides of the pan. 10) Add carrots and peas. 12) Stir in rice and salt. 14) Bring it to a boil. 15) Once it starts boiling, LOWER the heat to lowest possible. Cover it with lid. Let it cook for 17-18 minutes. Do not open the lid while it is cooking. Or do not peek into. 16) After 17 minutes, turn off the stove. Let it rest for 10 minutes covered. Then open the lid. 17) Fluff up and mix gently using fork. 18) It is ready to serve. Serving suggestion: Serve with yogurt or raita. Also have some papad or salad on side. Even it tastes good without any accompaniment. Green chilies are the only spicy ingredient in this rice. So adjust it accordingly. If making it for kids, reduce the chilies. Do not have time to dry roast the spices. Don’t worry, skip it. Add ½ teaspoon of garam masala later when you add salt. I have added green peas and carrot to this rice. But you can use your choice of vegetables like potato, cauliflower, corn, broccoli. Addition of veggies makes this rice healthy and full of nutrition. Wash the rice under running cold water till water runs clear. Soak into enough water for 20 minutes. Then drain the water and keep it aside. Dry roast the spices (cinnamon stick, cloves, cumin seeds and coriander seeds) on low-medium heat. Do stir continuously. You will get nice aroma of spices. Remove it from the pan and keep aside. Chop onion, ginger and garlic for paste. Also wash and remove hard stems of spinach. Remove the stems of green chili as well. Take everything (dry roasted spices and veggies) into the grinder or blender. Make smooth paste and keep it aside. Heat the oil in a saucepan on medium heat. Once hot add bay leaf. Saute for 30 seconds. Add prepared paste. Cook for 4-5 minutes. Add carrots and peas.Mix well. Stir in rice and salt. Add water. Once it starts boiling, LOWER the heat to lowest possible. Cover it with lid. Let it cook for 17-18 minutes. Do not open the lid while it is cooking. After 17 minutes, turn off the stove. Let it rest for 10 minutes covered. Then open the lid. Fluff up and mix gently using fork. Very glad that everyone enjoyed. Lucky!! you have your own garden !! Glad to know that rice came out well.